As a vaper, you can choose from hundreds of different e-Liquid flavors, which is one of the greatest benefits of using electronic cigarettes. However, when it comes to choosing your e-Liquid, you have a lot more to consider than flavor. You must also choose your preference of nicotine level and vegetable glycerin to propylene glycol ratios. Vegetable glycerin and propylene glycol play a significant role in the way your e-Liquid vapes. As a matter of fact, this is just as important as the flavor that you choose. Therefore, it is crucial that you understand the differences in order to choose the best e-Liquid. What is Vegetable Glycerin and Propylene Glycol? When shopping for e-Liquid, you will see vegetable glycerin referenced as “VG” and propylene glycol referenced as “PG”. Both of these things are used already in thousands of products in your everyday life. An organic glycerol, propylene glycol comes from propylene oxide, which is a byproduct of petroleum. It is used in a number of different products, such as chemical additives, medical products, pharmaceutical products, personal care products and solvents. A natural organic glycerol, vegetable glycerin comes from vegetable oil, such as coconut or palm oil. The vegetable glycerin is combined with water and heated to a high temperature and pressure. The glycerin is dissolved from the fatty acids and the water absorbs it. It can be found in medical, pharmaceutical and personal care products. What is the Difference between Vegetable Glycerin and Propylene Glycol? Propylene glycol is clear and does not have a taste, which will enhance the flavor of you e-Liquid. It has a thinner, less sticky consistence in comparison to vegetable glycerin. Therefore, less gunk will build up on your atomizer coil. In addition, it is absorbed more easily by the material in a cartomizer, which will result in a constant flow to the coil. On the other hand, vegetable glycerin has a sweet flavor that you can often notice as you vape. Because it is thinker and gummier than propylene glycol, it has a tendency to clog the coil of your cartomizer or clearomizer. If you want huge vapor clouds, you should choose vegetable glycerin. The e-Liquids that contain 100% vegetable glycerin provide a smooth feel and great vapor. If that does not appeal to you, then you may want to consider propylene glycol, which offers a clean taste and light vapor. 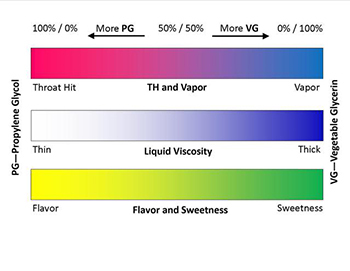 The throat hit is stronger in propylene glycol e-Liquids than it is with vegetable glycerin. Many who switch to electronic cigarettes to help with smoking cessation typically prefer this stronger throat hit because it is similar to smoking traditional cigarettes. If you do not want a strong throat hit, the 100% vegetable glycerin e-Liquids are very smooth with little to no throat hit at all. For beginners, it is best to start with a 60/50 ratio e-Liquid. This will provide you with a basic flavor profile that will allow you to get a feel for the differences between vegetable glycerin and propylene glycol. Then, you can begin adjusting the mix to suit your personal taste. Once you have a better idea of the ratio, flavor and nicotine flavors that you like best, you will be able to fully enjoy vaping.